Life Food and Beer: What's for dinner? It is that time again! Another WIAW Veggie style!! I have been trying to incorporate more veggies in our diet over the past few weeks and trying to try new vegetables, like Swiss Chard and Bok Choy. 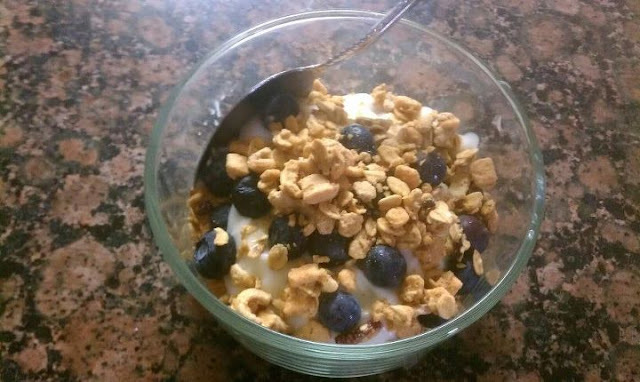 For breakfast, I had Mango Chobani topped with blueberries and my Homemade Peanut Butter Granola Bars crumbled up. I LOVE the Pineapple Chobani. I was not really a fan of yogurt and didn't think I would like Greek yogurt but decided to try it and LOVED IT!! I also enjoy the Lemon flavor too. I like Mango but was not a fan of the Chobani Mango. The mangos had a funny texture to them. I will probably just stick to Pineapple and Lemon! Lunch today was full of veggies and flavor. My leftover Cashew Chicken was just want I needed after a boring morning. I added Bok Choy, Green Beans, Bell Peppers, and Mushrooms. For dinner tonight, I could not figure out what I wanted for dinner. Huck laid out Skirt Steak. I have never cooked skirt steak, and personally do not like tough meat. We finally decided on Fajitas. I made a Fajita and Bean Burrito since we only had large tortillas. Mix together all seasons and rub onto steak. Allow meat to marinate for 20 minutes while you slice veggies. Heat grill pan over medium heat and add oil. Add peppers, onions, and mushrooms to pan. Saute for 5 minutes. Remove veggies from pan and add steak. Cook steak for 2-3 minutes per side. I like my steak medium rare. Cook longer depending on your preference. Remove steak from pan and allow to rest. Add peppers, onions, and mushrooms back to pan to warm. Slice steak on a bias, against the grain. Mix steak with veggies and serve with your favorite fajita toppings. I really like these Tortilla. They are only 71 calories, high in fiber, and taste great. For my burrito, I added refried beans with my fajita mix. I added lettuce, tomatoes, cheese, and salsa. I could have just ate the peppers and onions. They were cooked perfectly! 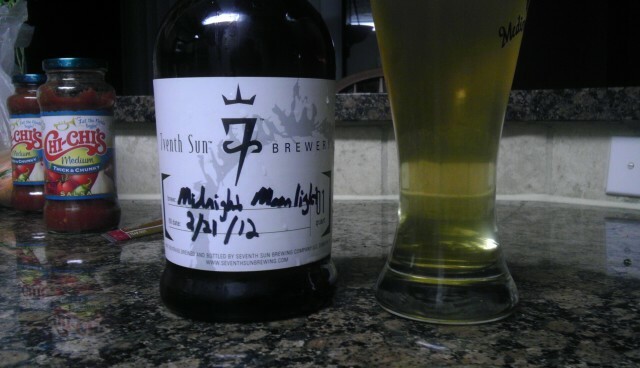 I enjoyed a beer Huck brought home from his buddy Justin's brewery in Tampa, Seventh Sun Brewing with dinner tonight, as well. The Beer was called Midnight Madness. It was a German Berliner Weisse style beer (A sour Wheat). Justin and Devon, the owners, are very passionate about beer. Seventh Sun offers a tasting room that is open Wednesday-Sunday. If you are ever in Tampa, make sure to check them out!! Well that ends another WIAW! If you like these recipes, check out my recipe tab. You can find other veggie filled recipes! loooove refried beans. that burrito looks so fantastic. i'm hungry! ME TOO!! The picture did not do the burrito justice, but I was to hungry to keep messing with it! They have not been open long. They are in downtown Dunedin. If you are ever in the area, you should stop by. Justin and Devon are really nice. Every time I see them, I learn so much about beer. They are like little beer encyclopedias!